7 p.m., 8 p.m., 9 p.m.
Come aboard if you dare for an evening excursion through the darker side of 'the people's city.' 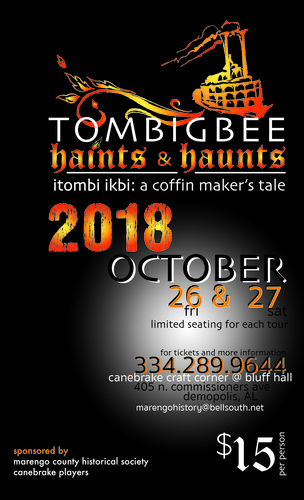 Join us for Tombigbee Haints and Haunts itombi ikbi: a coffin maker's tale, a spine-tingling presentation of stories about real people and true history! Tickets are available for $15 per person at the Canebrake Craft Corner next to Bluff Hall. Seating for each tour is limited, so please call the Canebrake Craft Corner at 334-289.9644 or email marengohistory@bellsouth.net for tickets and more information. Tickets are available one month in advance of the event at Bluff Hall, 334.289.9644. Demopolis is located in the Tombigbee River Valley Region of South Alabama. Be sure to check out places to Go, Eat, Stay, and other events in Demopolis.